Our data-driven digital marketing solutions will help you fuel the customer lifecycle, automate your operations, and improve ROI. For more than a decade it's been our mission, as the world's largest marketing SaaS company, to serve and inspire organizations of all sizes and industries to better communicate with their customers—transforming business through data-driven digital marketing. 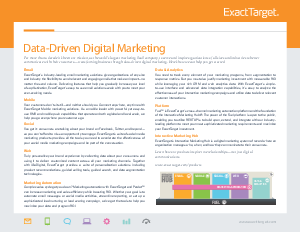 Interested in learning more about what ExactTarget can do for you? Take a look at our suite of products.